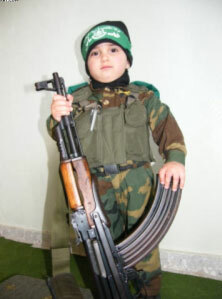 Recently, photos of armed women and children have been circulated by terrorist organizations in Gaza - Hamas, Islamic Jihad, and the Popular Resistance Committees. Some of these organizations have also been training women to produce and handle weapons. 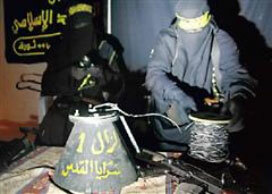 On March 16, 2009, the Egyptian daily Al-Masri Al-Yawm reported on women joining the Palestinian armed resistance. "Palestinian women are joining armed resistance and Islamic organizations in Gaza. This is evident from special photos given to the [Egyptian daily] Al-Masri Al-Yawm, featuring a group of women belonging to the military arm of the Islamic Jihad, the Saraya Al-Quds women's unit. Jihad women have been producing weapons, mixing nitrogen to prepare simple bombs and assembling parts for Palestinian missiles. "Iman Muhammad, a photographer for the Palestinian press, accompanied [these women] as they carried Kalashnikov [rifles] and handguns, filled magazines, and practiced shooting. She reported that following the Gaza war, some Palestinian factions had begun training women to produce and handle weapons, and were preparing to establish a women's military unit. "There Iman met Umm Muhammad and her daughter-in-law, who explained to her what they were doing and said that Islamic Jihad was not the only faction that engaged women in armed resistance. "The barrage of Israeli attacks during the first days of the December 2008 [Gaza war] killed hundreds of policemen and fighters. The enemy invaded cities and residential areas and murdered civilians in their homes. As a result, several factions decided to train female family members - there being at least seven or eight women in every family - to teach them defensive fighting, in case the enemy once more invaded residential areas." "Iman: 'The camera did not bother them, but the presence of a woman photographer did.' Umm Muhammad: 'What is better - a Muslim woman fighter or a Muslim woman photographer?'" "Muhammad, who was training his mother and his wife, said that 'women fighters are a new phenomenon in Gaza, which is still surrounded by an aura of secrecy, for security reasons.' But, he said, 'it is important that the world know that women and children are working for the [Palestinian] cause.'" "[In reality,] however, everything is much more complicated: Iman is the only woman photographer in Gaza, and obtaining this post was a difficult task. Gaza universities don't have photography departments, and Iman had to get her professional training with [news] agencies. She received advice from her male colleagues, but suffered greatly from attempts to restrict her movements and from lack of acceptance [as a woman photographer]. "Iman studies journalism and communication at Gaza Islamic University, and works as a journalist and photographer. She says: 'In Gaza, ordinary people are more accepting than the educated, who occasionally taunt me with sarcastic remarks.'" Al-Masri Al-Yawm (Egypt), March 16, 2009.